This book was reissued last year with an updated afterward about the connection to the Amanda Knox case. That got me curious and so I dove in. I have no idea why it took me so long to read this one, I really enjoyed it! 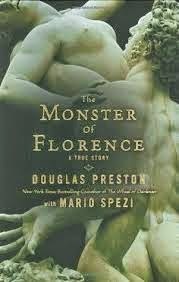 Douglas Preston is a thriller writer who was living in Italy and researching for a new novel when he stumbled upon a connection between the area he was living in and Italy's most famous unsolved crime...that of the serial killer the Monster of Florence. As luck would have it, the investigator he was talking with had extensively covered the case and filled him in on the details. The two decided to write a book to try to bring closure to the case, and ended up getting caught up in suspicion as well. I didn't know anything about this serial killer, so it was interesting to read the details of the case and the details of Italy, actually. Preston sort of outlines the darker history of Florence, which I knew nothing about and really enjoyed reading. And reading about how messy the investigations were, the way the various officials used the case to further their own careers and personal power, and it's sad to think the killer could have been caught if that had been the genuine interest of those involved! "madness is one unending scream of pain and need into the absolute silence and indifference of society." And also, "we all have a monster inside us (yes!!) the difference is in degree not kind." I actually found this brief section on how people created a sort of solution for the evil which mostly seemed senseless in the end to be very interesting. In any case, this is a pretty interesting read! Speaking of serial killers, have you noticed how TV shows about them have gotten more and more ridiculous? It's like they have to keep upping how horrific and gross they are while all the ones I know about in real life are just sort of...like they shoot people or strangle them or mutilate them (especially if they are women) but on TV they do elaborately disgusting things. Like, Hannibal has to be the worst of offender of this. I don't know, there's just something about this that makes me sad, you know that if someone shoots or strangles their victims that's not terrifying enough to us, IT HAS TO BE WORSE. I read the updated paperback copy of this book that was sent to me by the publisher.